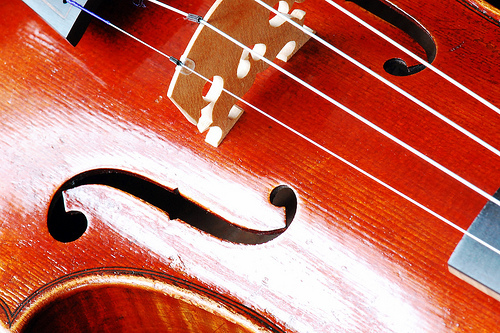 Music Costs > How Much Do Violin Strings Cost? How Much Do Violin Strings Cost? Part of the regular maintenance of owning and playing the violin is restringing it. It is suggested students change their strings every year, while professionals who play more often should do it every six months. Strings should also be changed if they start to sound dull or if they start to fray. A set of violin string can cost anywhere from $10 to $40, and this all depends on the quality, gauge, and manufacturer. A good quality set should be within the $15 to $35 range. Luis Claudio Manfio on Violinist.com recommends dominants with a Jargar or Larsen E are a good choice and should cost about $50. For example, strings made by D’Addario Helicore can be retail for about $30, while strings made by Pirastro Evah can cost up to $70. The JSI Special 4/4 Violin String Set, made of a medium gauge, can retail for $49 to $80. Guitar Center, for example, sells a range of strings for $5 to as much as $35. In addition to the strings, instructions for restringing will usually be included. If not, check out online tutorials or youtube.com to learn how to restring a violin. Most strings are made of a solid steel core and are going to have a particular playing length, scaled to fit a certain size violin. Most violins will have four strings; however, some may have as many as seven. If it does have these additional three, it will be typically used in a lower pitch than a G-string. Metal strings tend to be the most common choice and will be known to produce a full sound when played properly. Also known as steel core strings, you will find most folk and jazz musicians using these. Gut strings were created with sheep intestine and then wrapped with a silver or copper wire. While not used commonly today, some classical players prefer these strings because of the warm tone it offers. The downfall, however, is these type of strings may change with rising humidity levels and will need to be changed more than usual. Synthetic strings will be made from a nylon and will be primarily used by beginners. Not requiring much upkeep, these strings can produce sounds similar to the gut strings. If you are not confident in restringing the violin yourself, a professional music studio might be able to do it for you for $20 to $40. If you are taking lessons, your teacher may offer to do it free of charge. You’re going to get what you pay for if you’re going to consider purchasing cheaper strings. Invest in a string package that isn’t on the lower end in terms of pricing. With cheaper strings, many find they break easier and sound out of tune. If you currently have a teacher assisting you with violin lessons, ask for a recommendation in terms of brands. There is a good chance this teacher has been working with strings for many years now. To know what kind of strings you need, pay close attention to the silk windings at the peg ends. Most strings are going to be produced with a ball end, which means the end will slip down through the appropriate hole in the tailpiece. It’s crucial to pick out the right size to ensure the sound is up to par. Some experts recommend dominant strings for advanced players. These strings prove balanced sounds that can combine most sound characteristics. For beginners, however, most music teachers will recommend a budget set and will recommend advanced strings when they feel the time is right. If you’re unsure which strings you should buy, some music studios have testers for you to try. Violin string names? Lowest to highest – G, D, A, E.
One way to save money is to buy your strings in bulk. Multi-packs are generally cheaper per set of strings than individual sets. Check with various retailers online as many will offer discounted rates as well as offer clearance prices on brands that are overstocked and/or outdated. It may not be necessary to replace each and every string at one time. Instead, one string may only have to be replaced. Some brands may color code the strings to show you what note it is, making it very easy for a beginner to know which one needs to be replaced.